Here's a superb new online slot game from Eyecon Gaming. Shamans Dream is a 5 reel by 25 pay-line game that is brought to you from the geniuses at Eyecon. The theme of this game is simple, expect everything Native American to be the driving force in terms of theme/premise. Players will find themselves transported to times of old, where the American frontier was the backdrop for action and excitement that we can only dream or think about. Shows like Westworld have breathed new life into this genre although when people think of Native America two names come to mind: John Wayne and Clint Eastwood. If you are the type of player who is looking at finding similar footing to the ones taken by legends then you best have your wits about you, out here the quickest draw is the difference between life and riches beyond your wildest dreams. Now saddle up, it’s time to take to this land head-on on this slots casino game filled with action, you won't regret playing Shamans Dream thats for sure. Also, don't forget to look for starter bonuses at SlotsBaby. Shamans Dream has a lot of outstanding features that separate it from your rather bog-standard slot. The auto-play feature allows players to simply run as many games as they choose in the background while they go about their business. In the meantime might be suggest Shamans Dream saloon for a drink that might wet the whistle? Or better yet why not grab a seat at the Joanna (piano for the non-cockneys out there) and play everyone a tune. Eyecon are known to include the auto-play feature in most, if not all of their titles. We don’t know if their clientele is just lazy (no offence) or just enjoys being immersed in a world hands free, where the reins are slightly loose. Auto-play will continue doing what it knows best: play, until you tell it to stop, that’s the benefits of an auto mode ya see. Brisbane Australia’s own signature game developer Eyecon is known not only for its deep rooted passion for creating unforgettable online experiences much like Shamans Dream, but also ways in which to also push themselves forward within an industry that has thousands upon thousands of titles. Not many online game devs can hold a candle to the acumen of a company like Eyecon. The quality of games they produce coupled with their overall mentality when it comes to user experiences separate them from the pack. Their games can leave you in a lull of excitement unlike anything ever experienced before, that’s just the kind of company they are. Their games can leave you in a lull. If you were to mention the name Eyecon what comes to mind immediately is iconic. The past titles by Eyecon have all proven to have different levels of success across the entire globe. A staple in the online gaming scene, responsible for so many thoroughbred titles. We will admit to often being awestruck at the background/backdrop of Shamans Dream Slot. Everything you will see here defies expectation in every which way imaginable. Very rare do games such as this capture our imaginations in the best way. The sunset that cascades across the screen is nothing short of a spectacle, one that will continue to lure those caught in its gaze for as long as you keep running those blood-orange-touched reels. The sky is clear and there isn’t a care in the world here. This is nature at its finest, no concrete jungle to behold, only you and the west. Design wise Shamans Dream is one that is head and shoulder above any other slots that carry the same theme. Eyecon should be commended on their overall decision to create a game that tries to change up the wild west formula for the greater good. Even the music in Shamans Dream is one that you’ll be looking at making your personal ringtone so that everyone knows about this slot in some way. All the buttons for this slot can be found at the bottom of the screen — a perfect way to let players enjoy the scenery. Hitting the spin button will begin this adventure after players have selected their bet. Players who are looking for the auto-play feature will find everything you need next to the spin button. Symbols in Shamans Dream include: dream catchers, wolves, swords and eagles to name just a few. Each are clearly outlined by their design and colour. Every symbol will have a different numerical based value. It goes without saying but the more players match the higher the base score depending on how high that particular symbol scores. 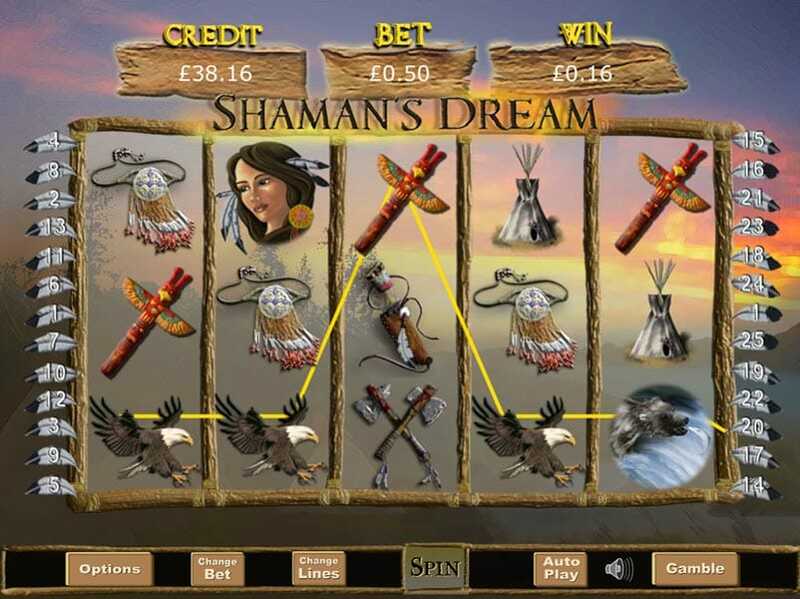 Shamans Dream Slot is a classic 5 reel by 25 pay-line slot so there will be plenty of opportunities for players to utilise different techniques/strategies in order to reap the rewards of the frontier. The wild symbol in this slot happens to be the wolf. He works alone so it might be best for players to adopt a similar approach if they want to find themselves in those high scoring brackets. The wild here acts in the same way any-other wild would in an Eyecon title: substituting any icon on the reels apart from the scatter symbol. There is a lot more to this slot than meets the eye. We could tell you more but we find that the best course of action is for players to go at it for themselves. Shamans Dream is one of those slots that will make you really want to run home and tell the family about, and who knows maybe they might find solace here and join you in your fantasies. A shared fantasy isn’t a lonely one although we understand if you’re the lone wolf type. 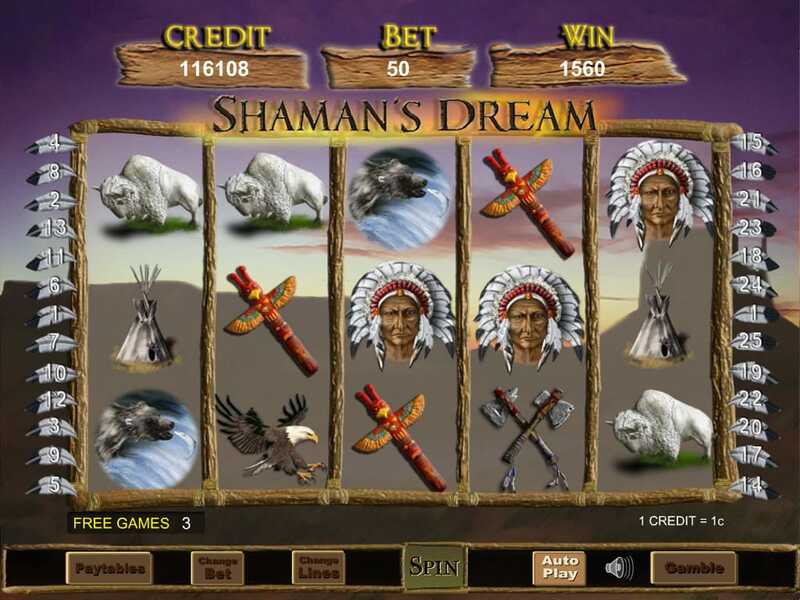 At its core, Shamans Dream is a slot that exists only to excite through rich and colourful designs/graphics, and an barrage of action and excitement with every spin of the reels. Remember to don your costume at home while you play this for added effect. This one’s for the dreamers out there, so come, join the shaman and you can ponder all of life’s great mysteries. 9/10. If you enjoyed then you might also like Gonzo's Quest.